It’s always good to correctly market your movie. I, and most people, went into Focus thinking it was a high stakes thriller about gambling. And it was, for about 45 minutes before it turned into a romantic cat and mouse game between its attractive leads. The movie ended up being decent, but slightly unsatisfying because it didn’t give audiences what they thought they were coming to see. Guillermo Del Toro (Pan’s Labyrinth, Hell Boy, Pacific Rim)’s latest film markets itself as a spooky ghost story set in the late 19th century, but it is actually more of a soap opera-esque mystery. The film stars Mia Wasikowska as an aspiring author and daughter to a wealthy industrialist. After being swept off of her feet by an aspiring inventor (Tom HIddleston) she is whisked away to his withering mansion to live with him and his dreary sister (Jessica Chastain). But her father (Jim Beaver) and an old friend (Charlie Hunnam) feel the siblings are not what they appear to be. The film certainly has its share of interesting twists and turns, but if you’re looking for a horror story, then you’ll be vastly disappointed. The movie offers up only a few eerie moments, some of which are a bit laughable thanks to less than stellar CGI. Guillermo Del Toro is known for having a love affair with the subject matter of his films and the same can be said here. There is great attention to detail in the costumes, cinematography, and gorgeous set design. But that is not what we’re coming to see. We’re coming to see what was shown to us in trailers, commercials, and promotional materials which is a ghost story. Early in the movie, Wasikowska’s Edith Cushing describes one of her novels not as a ghost story, but as a story with ghosts in it. 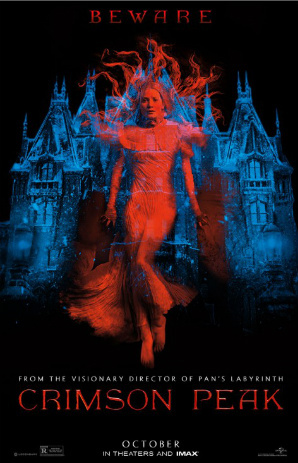 And that’s what Crimson Peak is, but it sure would’ve been nice to know that ahead of time. The movie ends up being decent, but not nearly as intriguing as what you might’ve anticipated. 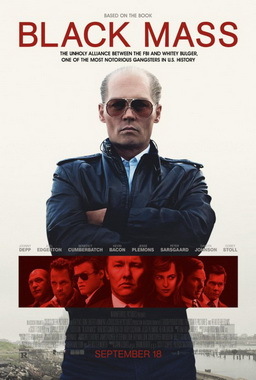 BLACK MASS Scott Cooper (Out of the Furnace) helms this biographical film about South Boston criminal Whitey Bulger and his time as an informant for the FBI in the late 1970’s. The film features an all star cast that includes Benedict Cumberbatch, Joel Edgerton, Kevin Bacon, Dakota Johnson, and Peter Sarsgaard. Professional changeling Johnny Depp goes bald, puts in blue contact lenses, and conjures up a Boston accent to play the lead role. THE WALK 3D There’s a reason I included the ‘3D’ moniker. For the most part, 3D technology has become an tired gimmick used only to squeeze every dollar out of moviegoers. But every once in a while, when the technology is used to its actual potential, a movie is made that is meant to be viewed in the format (Tron: Legacy, Ant-Man). And seeing the movie without the 3D means doing yourself a disservice. 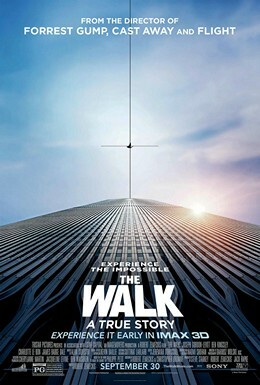 The Walk is one of those movies. Anyone who casually follows my blog is probably aware of my love/hate relationship with sequels or spin offs. It’s a simple concept: If a sequel is made with an interesting story that furthers the arc of the previous film’s characters and presents them with new challenges, then I’m all for it. But, if a sequel is made as a retread and/or exists only as a means to capitalize on the popularity of its predecessor, then I have no problem rejecting it. Director Joe Wright’s Pan isn’t exactly a sequel, but it does carry several of the symptoms of a soulless cash grab. Pan isn’t really a prequel either (It isn’t directly linked to any other film), but rather an origin story of the classic Peter Pan play/novel/movies we’re all familiar with. It begins with baby Peter being dropped off at an orphanage by his mother (Amanda Seyfried). The orphanage (seemingly a retread from what we’ve seen in Matilda or Oliver Twist) is run by a grouchy nun who secretly spends nights selling boys to magical pirates. 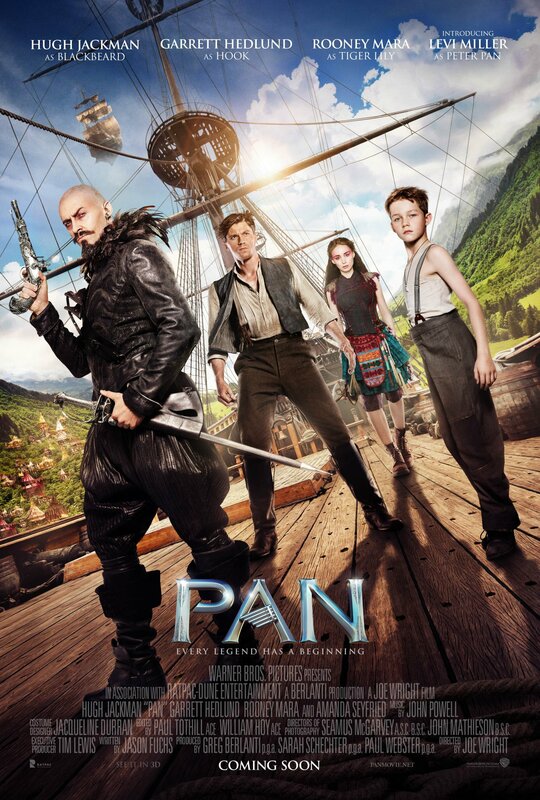 One day, young Peter (Levi Miller) is abducted and taken to Neverland, where he is forced to mine for fairy dust by Blackbeard (Hugh Jackman). Here, he meets up with a young Captain Hook (Garrett Hedlund) and Mr. Smee (Adeel Akhtar) who help him flee Blackbeard in search of the island’s natives, led by Princess Tiger Lily (played by the noticeably caucasian Rooney Mara). The natives believe that Pan is the chosen one who can lead them and the fairies to an uprising over Blackbeard’s pirates. If the summary seems a bit rushed and nonsensical, it’s because the movie basically is. Too often the movie feels like it’s being written as it goes along, filled from head to toe with expensive CGI and heavy doses of fantasy clichés. Peter being the “chosen one”? A half-baked love story between Lily white… I mean Tiger Lily and Hook? The source material lends itself to something better than this. It would also be relatively acceptable, if the story made a connection to the original classic in more ways than just including big name characters. What are the origins of Neverland? Why does Captain Hook eventually become Peter’s arch nemesis? Why does Peter Pan decide to never grow up? None of these questions are even touched on and it makes this film feel less like a prequel and more like some generic fantasy rip off. The one sort-of bright spot is Hugh Jackman as Blackbeard. Before being transformed into a standard sniveling antagonist, Jackman channels his inner Johnny Depp with an opening monologue that is both charismatic and eerie. The rest of the cast is disposable from Garrett Hedlund’s over the top accent to Rooney Mara’s embarrassing attempt at playing a Native American. More screen time for Jackman’s Blackbeard might have made the movie more watchable, but it still wouldn’t have been enough to rescue a mediocre story void of the elements that make Peter Pan special. Pan is almost comically inconsistent and easily forgettable. There is a reason Peter Pan is a timeless fantasy and after watching this film, I’m not even 100% sure the makers of it have even studied the original. Ridley Scott brought us such cinematic classics as The Gladiator and Blade Runner, but lately, it seems the famed director has lost his touch. Prometheus was underwhelming, The Counselor was a flat out mess, and just thinking about last winter’s Exodus: Gods and Kings sends me into a world of frustration. Simply put… Ridley Scott, you owe us one. Scott’s latest film follows the trend of recent fall space films such as Gravity and Interstellar which trade big budget action sequences for scientific realism. If you’ve seen those films then you should know to prepare yourself for a movie that is more Cast Away than Star Trek. 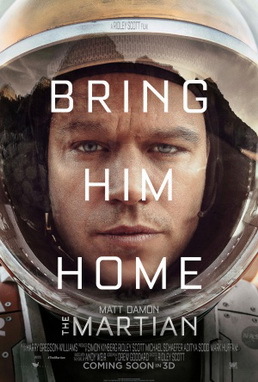 The Martian stars Matt Damon as Mark Watney, a U.S. Astronaut who gets stranded on Mars after he gets separated from his crew during a violent storm. Presuming him dead, the world grieves until they find out that Watney has managed to not only survive the storm, but also figure out a way to stay alive until a 4 year manned rescue mission can be put together. Some (the same people bored by Gravity and Interstellar) will be bored by The Martian. The story is often methodical and filled with scientific jargon you aren’t really meant to understand as much as accept. What makes The Martian captivating through its meticulous pacing is a surprising dose of humor thanks in large part to the charisma of its lead actor. Matt Damon’s charm and ability to bring a humbling sense of emotion to his character made me route for him as if he really was stranded alone on a barren planet. The supporting cast, loaded with big names and recognizable faces, is mostly good, but not memorable. The exception is Donald Glover as a quirky astronomer who is hilarious in limited screen time. Although the journey feels lengthy, it is undeniably fascinating and heartfelt. The movie also provides breathtaking visuals along the landscaping of Mars, although you’d be foolish to pay the extra money for 3D here. Overall, The Martian may not be a classic, or as suspenseful as 2013’s award winning Gravity, but it is an educational and amiable story about human courage and resilience. And more importantly, it is enough to get Ridley Scott back in our good graces.